Have you ever actually completed a defensive driving program? Was it a positive experience? Chances are, it was not. Attending a conventional defensive driving course is tedious and requires a lot of time to be carved out of your busy schedule. Why not use a smartphone compatible AP that will allow you to breeze through interesting content at your own convenience and still end up with the same certificate? Welcome to defensive driving with Funnybone! Why do you need to enroll in a San Antonio defensive driving course at all? Go to court! Everyone likes using a sick day to stand in front of a judge, right? Maybe it will even go your way! Pay the fine! Don’t worry, it’s just your hard-earned money. Unfortunately, it will also remain on your driving record. Complete an easy online program that will result in your ticket being dismissed and you receive a nice drop in your monthly insurance cost. Sorry, this one speaks for itself. 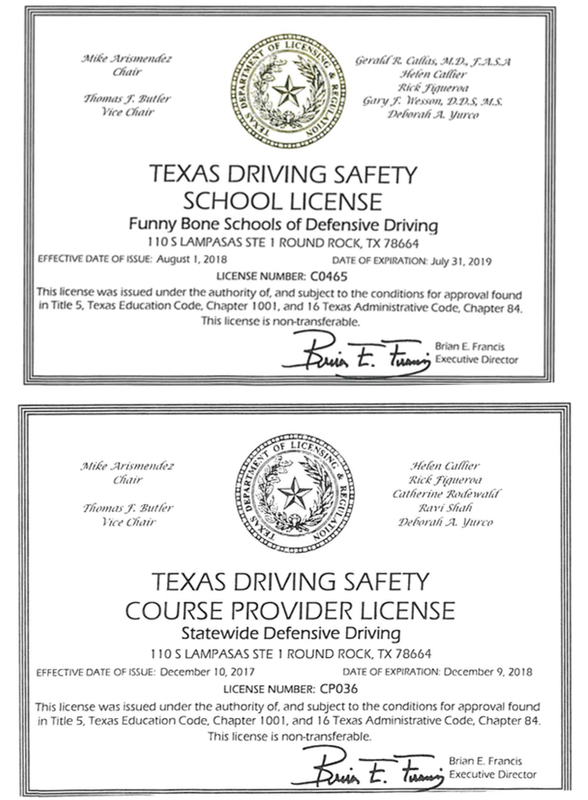 Funnybone defensive driving school is acceptable to all Texas courts for traffic ticket dismissal AND insurance discounts. Ah, the joy of autonomy. The day of the average American isn’t exactly teeming with free time to be dropped on lecture hours across town two nights a week. Especially when there’s a mobile option that lets them use the little moments they find throughout the day to complete their defensive driving program. Completing defensive driving with Funnybone will require 6 hours of your time on your schedule. Even if you get busy, you still have 90 days to complete the course! Don’t drag yourself through content that makes your brain numb. 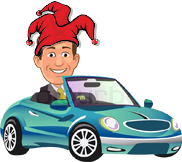 At Funnybone, we don’t see a reason why defensive driving should be a miserable experience. Our program is entertaining, engaging, and will absolutely fly by. Complete your work on any device! Funnybone’s content can be accessed from your home computer, your work laptop, or even your smartphone. You can use all three options interchangeably without fear of losing your work. It really couldn’t be any more convenient. We get it; it can be tempting to just pay the ticket and make the problem go away. The problem is paying a traffic ticket doesn’t make it go away: it ends up on your driving record for 3 years. That’s a long time. Even a 2-point assessment from a moving violation on your driving record can cost you when it comes to your car insurance. If you accumulate 6 or more points within 3 years, you will need to pay a $100 surcharge on top of your higher insurance premiums. Think the hit to your insurance will be minimal? Think again. Expect your insurance to go up by 20-30%. That’s around $280 to $430 more you will pay for the next three years. The cost may be even higher if this will be your second traffic ticket. That’s on top of the $150 to $350 you’re already facing from the ticket. At Funnybone, we think that’s a lot to pay for a mistake. Don’t throw away your hard-earned money by giving in and paying the ticket. Our defensive driving classes in San Antonio, Texas are the perfect alternative to get rid of that ticket with a fun and convenient course. Get an insurance discount while you’re at it! Defensive driving courses aren’t just for dismissing traffic tickets; Funnybone courses can also earn you a discount on your car insurance. Imagine that: you can avoid paying that hefty ticket and the consequences that come with it AND qualify for lower car insurance rates. Call your insurance provider and ask if they provide a discount for taking defensive driving classes in San Antonio, Texas. There’s a good chance they do. To qualify, you probably just need to submit your Certificate of Completion to your insurance company once you finish your Funnybone course! Want to take that third option to avoid court or paying the ticket? Opting for defensive driving school instead is really easy. All you need to do is contact the court to request permission to take defensive driving. You can do this in person, over the phone, or in writing using your citation. That’s it! From there, the court will need you to mail in some forms and documents like proof of insurance, your signed citation, and a small court administrative fee. You can then enroll in the Funnybone defensive driving class. Our classes are fun and self-paced. You’ll have plenty of time to complete the course by the date the court requires which is usually 90 days. You can definitely find six hours in your schedule in the next couple of months to avoid the cost of that ticket, right? At Funnybone, we figure that if convenience is supposed to be the name of our game, you shouldn’t have to wait. As soon as you complete your course, we will send your Certificate of Completion in the mail and you’ll have it in just a few days! Overnight delivery is also available for your Certificate of Completion. Should any problems arise, our customer service team is waiting to assist you seven days a week. Don’t even bother waiting down at the DPS for a report of your driving history. We’ll request one for you. Funnybone takes the monotony and time consumption out of defensive driving by expediting wherever possible and making the process enjoyable for you. Sign up with Funnybone San Antonio today and enjoy the benefits of defensive driving without the hassle!